The deadline has come and gone, and the City of Pointe Claire says it has not heard from the company that was storing PCBs illegally for the past 15 years. Reliance Power Equipment had until midnight to come up with a plan to remove the transformers full of the chemicals and to clean up the PCB-laden oil from its West Island property. Between 800 and 1,200 litres of oily liquid containing large concentrations of PCBs (polychlorinated biphenyls) leaked from Reliance's property last March. Now that the deadline has passed, the environment ministry is set to take over the cleanup. McMurchie also asked Montreal's public health agency to inform Pointe Claire residents of the health risks associated with the Reliance operation. "Council requires that the ministry make public any information related to this site, the contamination level, as well as any other relevant information," he said. 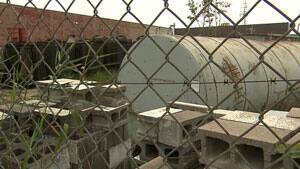 The City of Pointe Claire will continue to monitor the site until the Quebec government takes over. It's estimated the cleanup will cost between $2 and $2.5 million. Yesterday, Environment Minister Yves-François Blanchet said Reliance Power Equipment will be billed for the work. McGill environmental assessment expert, Michel Bouchard, says until the cleanup is completed, there should be around-the-clock security at the site. He says PCBs are volatile, and present a serious health risk. "The real danger is combustion, either accidental fire or…[arson] by somebody who would want to do something bad," Bouchard says. If the contaminated area caught fire, smoke carrying the PCBs could spread to outlying areas, including Montreal. PCBs were once used as a coolant and insulating fluid. The import, manufacture and sale of PCBs were made illegal in Canada in 1977. However, Canadian legislation has allowed owners of PCB equipment to continue using the equipment until the end of its service life. In 1988, 500 barrels of oil laced with PCB exploded at a warehouse St-Basile-le-Grand, sending plumes of smoke across the region and forcing residents to flee.